As protests continue across Iran for the seventh day, one woman is being hailed as a "hero" after a video of her removing her hijab in an apparent protest was posted on a social media site. The footage shows the woman standing on a box, waving the hijab at the end of a stick like a white flag. The video of the woman's defiant gesture was posted on Twitter by Armin Navabi, a former Muslim from Iran and author of Why There Is No God. "This woman in Iran took off her Hijab to protest the mandatory Islamic dress code imposed on Iranian women," he tweeted, using the hashtag #IStandWithHer. The tweet has been retweeted more than 15,000 times and liked more than 33,000 times. There were unconfirmed reports that the unidentified girl was taken into custody, but there was no way to confirm it. A few weeks before the May 2017 election, more than 180 women’s rights activists signed a declaration stating their demands to the next president and thousands of local council members. Among the demands: the call for women to fill at least 30 percent of ministerial positions and an end to all gender discrimination. But that effort largely fell on deaf ears. This is a sharp departure from the June 2009 presidential campaign when two reformist candidates backed women's rights. 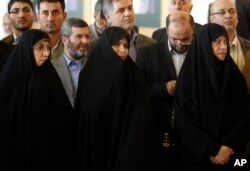 And, after winning the election that year, hard-line President Mahmoud Ahmadinejad nominated three women as ministers amid opposition from conservative MPs and some senior clerics. One of his appointees, Marzieh Vahid-Dastjerdi, was approved and she became the country’s first post-revolutionary female minister, serving as minister of health and medical education. FILE - Then-Iranian Health Minister Marzieh Vahid Dastjerdi, center, stands with lawmakers during a press briefing in Tehran, Iran, Sept. 3, 2009. After President Hassan Rouhani won the election, he claimed he would open up social and political opportunities for women. One prominent appointee was Shahindokht Molaverdi, who became the vice president for women and family affairs. Despite her hands being tied as she came under huge pressure from hard-liners, Molaverdi contributed to the national gender debate by condemning those hard-liners who threatened female spectators at a men's volleyball match. During her term, Molaverdi stated repeatedly that she did not have the executive power to advance her own projects. Her attempts to take measures in favor of women’s rights were all met with such pressure she was forced to back down. FILE - Then-Vice President for Women and Family Affairs Shahindokht Molaverdi speaks in an interview with The Associated Press at her office in Tehran, Iran, June 8, 2015. When Molaverdi was eventually removed from her post, she was replaced by Massoumeh Ebtekar, who was removed from her position as head of the Environmental Protection Agency, to be replaced by a man. Rouhani’s failure to appoint a single woman minister to his Cabinet was likely the result of the regime in Tehran, namely the Supreme Leader Ayatollah Khamenei, who continued his campaign of the suppression of women. The ayatollah sought to reduce the Islamic Revolutionary Guard Corps’ power it gained when it quashed the protests after the 2009 election of Ahmadinejad. Khamenei found the ideal candidate in Rouhani, a respected cleric who appealed to moderates but was loyal to the system. But, many who counted on Rouhani’s election promises felt betrayed. Parvaneh Salahshouri, who heads the women’s faction in parliament, has criticized Rouhani. The state-run ISNA news agency in August quoted her as saying, “It is incredible and shocking that the president has ignored half of the Iranian society. FILE - An Iranian woman holds leaflets showing Parvaneh Salahshouri, a candidate in parliamentary elections, during a reformists campaign rally in Tehran, Iran, Feb. 18, 2016. This disappointment fomented into the largest demonstrations to strike Iran since its disputed 2009 presidential election. To date, at least least 21 people have been killed and hundreds of people have been arrested, including several women. Last week, police in Tehran announced they would no longer arrest women for failing to observe the Islamic dress code. They will be given counseling instead. Several images will likely be iconic of this year's demonstrations including a young woman – reported to be a student – covering her face as she runs from tear gas just outside the University of Tehran, her fist raised defiantly in the air.